"Ireland. My ancestral home, where so little has changed since my people emigrated to America more than a century ago. "Perhaps because Nanette and I haven't yet made our pilgrimage to the Emerald Isle, the "aulde sod" has assumed a mythical dimension in my mind. To me, Ireland means tradition and stability, charming customs, love of family, and a faith as enduring as the austerely beautiful landscape itself. 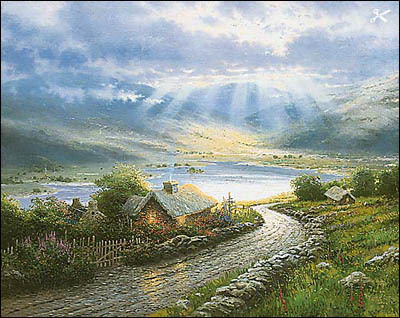 "The Ireland I've portrayed in Emerald Isle Cottage is a land rooted in the earth, but touched by a heavenly light. The humble cottages, thatched and weathered over centuries, seem anchored in the ground; they belong to the land. Yet the atmosphere is charged with radiance; golden shafts from the hidden sun dance like spotlights on the distant lake. "How delightful it would be to step into the Emerald Isle Cottage canvas, and actually walk the dusty roads that meander along its ancient stone fences. Nearly as old as time, these fences have no destination; they are as intriguing and as mysterious as destiny itself." 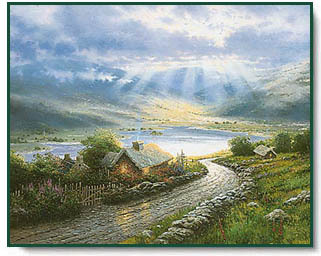 Emerald Isle Cottage copyright ©1996 by Thomas Kinkade.